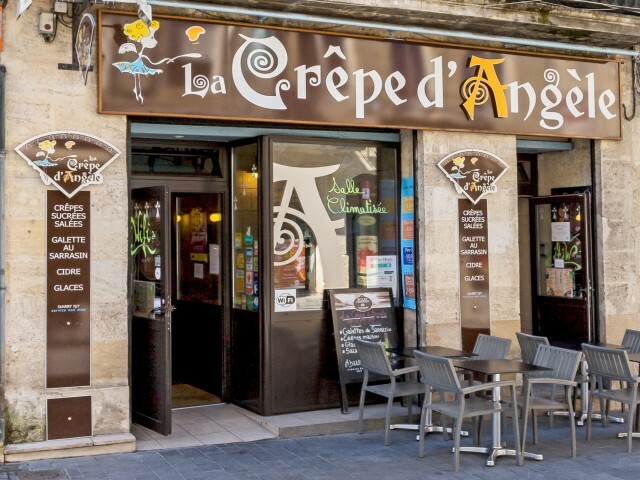 The Crêpe d'Angèle is located in the city center of Bordeaux, a stone's throw from Place Gambetta, opposite the entrance to the cinema UGC ciné cité. In Brittany, from Morbihan near the Brocéliande forest, Jean-Paul ate his first Galettes made by his grandmother ANGELE on a bilig (crepe) heated by a wood fire. He created this crêperie in 2001, hard to do better the establishment is open 7/7 without interruption from 11:30 am to 11:30 pm. Pancakes, Pancakes are made in front of you. A terrace opposite the cinema, the possibility to privatize a room upstairs, a bowl of Cidre Breton. You want to open a creperie, you start in the adventure, a training center of crepier also exists at this address.